Beasts of the Mesozoic — Mountain and Forest Accessory Packs, and Nestlings (grey) review – AiPT! After a lengthy development period, the Beasts of the Mesozoic figure line by David Silva is arriving. This review will take a look at the “Mountains Accessory Pack” and the “Nestlings (grey)” figures. When dealing with dinosaur toys, enthusiasts noted that the figures often swung back and forth between being inaccurate monstrosities and accurate statues. Seeking to fill the hole in the toy market for articulated, scientifically accurate dinosaurs was David Silva, a toy designer and sculptor who has worked for a variety of companies in the past, with his most recent work being with NECA. Silva’s Beasts of the Mesozoic line was developed thanks to Kickstarter with the first wave specifically focusing on dromaeosaurid clade, a group of dinosaurs that included the famous Velociraptor. That campaign was a resounding success, and grew to include the environmental accessory packs discussed here, to pair with the raptor figures themselves. The Mountains Accessory Pack comes in a solid cardboard box with art by Jonathan Kuo depicting the Troodon formosus that comes in the pack against a wintery backdrop. Removing the top of the box reveals a transparent clamshell packaging that safely protects most of the contents, while a small baggie in the back holds some of the set’s smaller pieces. The set itself is huge. The main portion of the set consists of an irregular 6″x4″ base, 10.5″ tall tree, a nest with a removable hatchling, a rock, a fern, and the juvenile Troodon. Also included are a short and tall jumping rod, with various heads to attach, a separate base for the Troodon, and four removable ballpegs that can be moved around on the base. The interior of the box, however, adds even more value as it has been given a diorama styling, with a photo of a mountainous environment to serve as the backdrop for any display. The nestlings come in a three pack, with a base for each of the young hunters. The packaging is windowed cardboard that opens at the top. From there, you remove a clamshell package that contains the raptors and their bases. The back of the box features some really lovely art by Sara Richard that depicts the nestlings at play in a rocky environment. The sculpting and paint detail throughout the Mountains Accessory pack is superb. Both the large and small bases have a primary slate color for the rocky environment, with green foliage sculpted and painted throughout. One of the great things about the paint on this set is that these aren’t simple one-color washes. There’s multiple layers to the paint and that really makes the set feel alive as opposed to a piece of plastic. The edges of the base are also sculpted so that they can fit the adult raptor bases alongside it, allowing for an ever larger display. The tree itself is also well sculpted, with beautiful lines that make it appear natural. The branches at the top have an extraordinary detail, and the leaves have just a little bit of snow that makes the set feel even more like the mountainous environment it depicts. The tree is 10.5″ tall, and while that makes it more of a sapling in 1/6 scale, it gives the set a lot of vertical dimension and works as a larger tree if bringing in other figures from 1/12 or 1/18 scale lines. The rock which can be used anywhere on the set is sculpted on both the top and the bottom, giving it some flexibility in how it is displayed. And the ferns are nicely sculpted as if a light breeze was blowing through them, making them more dynamic. The centerpiece of the set though, is the young Troodon formosus. The figure measures six inches in length from the snout to the tail tip, representing a three-foot long juvenile. The dinosaur is covered in beautiful white feathers with a black undercoat of paint. The eye is a nice yellow, and the inside of the mouth (including the tiny teeth) is painted with great care. There’s very little paint slop, which is nice considering how small the teeth are. The 1/6 scale set can also work as a 1/12 scale approximation with figures like this 6″ Marvel Legends Black Panther. 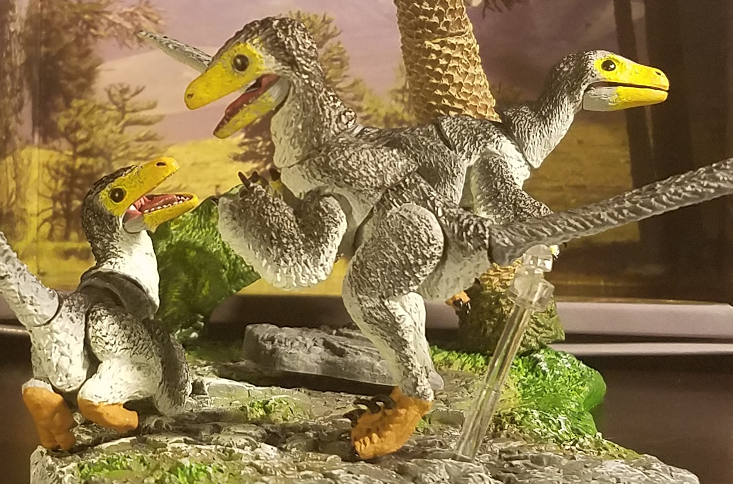 One of the appealing side effects of using a juvenile Troodon is that it is almost perfectly scaled to serve as an adult for figures in the six inch (1/12) scale range. This doesn’t quite work with the dinosaurs found in the other accessory packs, where the dinosaurs are based on animals that were quite small, even in adulthood. The Nestlings with pieces from the Mountain Accessory Pack (not included). The Nestlings are very nicely detailed, with sculpted feathers throughout the body. The snouts are a nice golden yellow before giving away to the grey feathers that transition from nearly black along the spine to a white underside. Both the finger and toe claws are painted a nice jet black. Within the mouth, both the tongue and the tiny rows of teeth are also painted, providing a great level of detail for figures of this size. The bases are painted with a rocky gray, with some hints of foliage. This coloring matches that of the base for the Mountains Accessory Pack, making them nice complements of each other. The Mountains Accessory Pack is fairly modular, with four places to insert the various connective devices into the base. While there’s an obvious place for the tree in one of the corners, it can, using its peg, be placed anywhere on the base, though it may need to be rotated to keep the base from tipping over. The nest of eggs can also be moved around, and the egg with the hatchling emerging is a separate piece from the nest itself, allowing both pieces to be displayed on their own. The tiny hatchling can actually rotate within the egg, giving some added variability. The Troodon has eight points of articulation: (1) a jaw hinge, (2) a ball-joint at the base of the neck, (3+4) swivel hinges for the shoulders, (5+6) ball joints for the hips, (7) a ball joint at the base of the tail, and (8) a bendy-wire in the tail itself. This allows for a great variety of poses, especially when combined with the jumping rods in the set which can either support the figure’s body or clip to its tail. The Nestlings feature an astonishing nine points of articulation: (1) a jaw hinge, (2) a neck ball joint, (3) a waist ball joint, (4+ 5) swivel hinges on each of the shoulders, (6+7) ball joints at the hips, (8) a tail ball joint, and (9) a bendy-wire in the tail. Each baby comes with at least one peghole in their feet for use with either their own bases or onto the ball-pegs that can be moved around on the accessory packs. Fitting these joints onto such small figures gives the set a lot of play value and poseability, however it also led to the only two hindrances on the figures. The jaw hinge on one of my nestlings was not properly fit, so I have to push up at the base hinge while simultaneously pulling down on the tip of the jaw to get the mouth to open from a closed position. Additionally, while the nestlings fit nicely onto the pegs, the weight of the figures creates a lot of tension at the hip joint for the two babies who stand, so I wouldn’t recommend leaving them on the pegs for an extended period as you run the risk of loosening the joint or the plastic around the peg. Other than those minor issues, these are fantastic figures, with a lot of potential either for play or dioramas. Since the heads are all on ball joints, you can – with care – actually pop the heads off and rotate them around, giving the set even more variability. If it isn’t obvious already, both these sets are fantastic. There’s a lot of playability to be found, though some of the smaller pieces might be an issue for younger children (the packaging labels the set as for ages 15 and up). The sculpting and articulation should make these must-haves for any dinosaur lover. The mountain environment and the Troodon both make good display pieces on their own, but together (or with some of other products in the line, such as the Nestlings), it really comes alive. There are some minor issues with some of the joints on the Nestlings, but it’s still amazing that there are nine points of articulation on these figures. Silva has done a fantastic job with the sculpting, creating a look that is both playful and realistic. If the larger figures match the quality found here, the line will be a wild success. While not appearing in mass retail, you can order the Beasts of the Mesozoic figures from the Backerkit Survey, Dan’s Dinosaurs, Big Bad Toy Store, and others. The Troodon chases some juvenile nestlings up a tree where they call for their parents. And if you’re looking for the Beasts in live action, check out Russ Dobler’s unboxing of the Forest Accessory Pack! These sets have a ton of value on their own, never settling for being a secondary product. Fantastic additions to the collection of any dinosaur enthusiast. Beautiful detail throughout all the pieces. Made to be adjustable, adding a ton of variety to the displays you can create. The articulation is fantastic for small figures of this size and shape. The two sets pair well together. The full-size raptors aren't out yet and I need them. Some minor QC issues with one of my nestling's jaws, but that may be particular to my set, not a larger issue. I would advise against leaving the nestlings pegged to their bases for too long, as the joints may wear.